Feeding a baby has it’s own struggles, but feeding a toddler brings an entirely new set of nightmares to the stage. Why? Toddlers are emotional. I don’t mean that they cry a lot or sometimes throw temper tantrums. I mean they are emotional the way a completely hormonal and irrational pregnant woman gets about someone stepping on a ladybug. The problem is you not only cannot fully understand their reasons for freaking out, but once they get going, you have very little power to help them understand reason. Now, this doesn’t happen every meal, but the closer he gets to 3, the greater our struggles have become at the table. I thought I’d done everything I could leading up to this point to get him to be a healthy eater with a varied diet, but learned practices from my childhood got in our way. 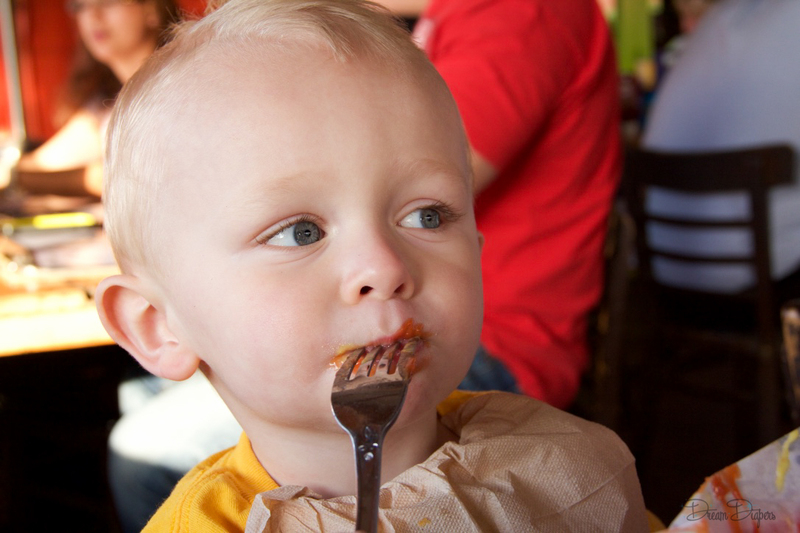 When Lucas started solids, he would eat pretty much anything we gave him. However, I didn’t give him jarred baby foods that included meat/pasta. I felt like at that point, those were fillers (and frankly disgusting. Would you want to eat pureed meat? Me neither. So I didn’t make him). 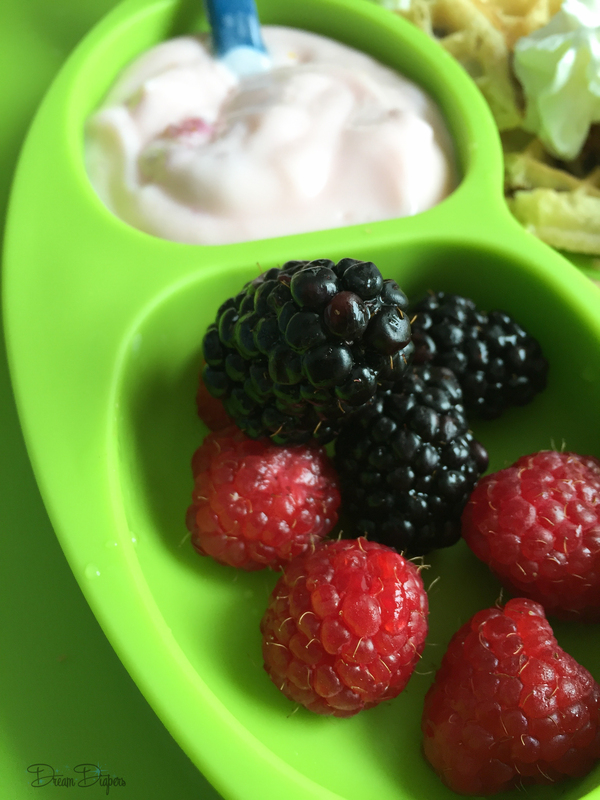 Now, he LOVES fruits and vegetables (kid is a green bean fanatic and will even eat salad), yogurt, eggs, milk, all kinds of cheese (kid loves chèvre), whole grain bread, pastas, legumes, peanut butter, and a myriad of spices on his foods. But guess what he doesn’t eat much of? Meat. He’ll eat it in spaghetti sauce, tacos, hot dogs (all beef natural hot dogs because otherwise it just freaks me out), lunch meat, and in soups, but that’s about it. Pork chops or chicken breast? No way. Steak? Forget about it. I’m not concerned; I know he gets protein and iron in other places in his diet, but it’s frustrating because I don’t want to make something different for him at mealtimes, but I want him to eat so that he is healthy and continues to grow. It’s SOOOO frustrating when your kid won’t eat everything on his plate and then half an hour after lunch is asking for a snack. However, it’s important to teach our kids to listen to their bodies when they feel full. After all, they are little, their tummies are little, and their portion sizes will vary depending on what they ate/drank earlier in the day and maybe depending on when they last pooped (sorry but it’s true). Encouraging them to clean their plate teaches them to overeat. It’s okay to nudge them to have a few more bites of X before they leave the table, but never force it. Dinnertime shouldn’t be a battle, and giving kids negative associations with meals only perpetuates the undesirable behaviors. Solution to the snacking problem? Only allow them to snack on either leftovers from their plate or a healthy alternative of your choice (fruit, nuts, vegetables, etc.) and tell them they need to drink half a glass of water before they have a snack. Most times kids are thirsty, not hungry, and they don’t know how to differentiate that yet. This is the one I’ve had the hardest time with because growing up, if you didn’t eat your dinner, you didn’t get dessert! It was a privilege! But that’s just the thing, it teaches kids that sweets are a reward for good behavior. Not going to lie, when I think about it, I totally reward myself with indulgent foods if I do what I’m supposed to do- I did the dishes and cleaned the kitchen before bed! Time for ice cream! This day has been horrible! I deserve a glass of wine! etc. It encourages an unhealthy relationship with fats and sweets, emphasizing extrinsic rewards (a packet of fruit snacks) instead of intrinsic rewards (feeling satisfied/full) for taking care of themselves in a healthy way (eating their dinner). “But, Kristen, then my kid will eat the cookie and nothing else!” That’s what I thought too, but as it became part of the routine, he didn’t stave off eating one thing to leave room for dessert afterward. He sampled everything and worked around his plate stress free, not wondering when mealtime was over so that he could have his cookie. Now, I definitely lessened the portion of dessert, and if he only ate the dessert and asked for more, I told him he needs to eat X and Y first and see how he feels first. So far, this strategy has been more of a win than a loss for us. Also, dessert doesn’t have to be a cookie or something unhealthy: dessert can be fruit with/without a little dollop of whipped cream! It’s so difficult to not project your own preferences with food onto your kid. Olives?! GAG ME. But guess who loves them?! Cottage cheese?! I can’t. I just can’t. But guess who likes it? Same goes for things that I love but Lucas can’t stand- lemon butter chicken, raw carrots, grilled squash- I can’t be offended he doesn’t like them and try to force him to eat them because he’s not me! So here’s the thing, try to give a new food fairly often so that your kid has an opportunity to try new things (even if you don’t like the foods). Just don’t force them to eat it. Put a little big on their plate and encourage them to be brave and try new things. If they don’t like it, they don’t have to eat more of it. My favorite trick my mom used to use with us was, “If you don’t like it, you can spit it out in my hand.” Ka-ching! An opportunity to do something gross without consequences?! Sold! If you want to teach them better manners than that, you can say instead, “You can spit it out in this napkin.” Also, monkey see, monkey do applies to food too. If you want your kid to try something, you should try it too (even if it means trying something you’ve already tried). Here is where the “I don’t want to make a separate meal JUST for him” attitude comes into play and how we remedied it. Lucas doesn’t get a different meal (although sometimes there are anomalies from this rule). I simply try to plan the meal to include a variety of foods that are familiar to him, with at least two foods I know he likes, with one that is new or something he’s still learning to try. Research tells us that you usually have to try a new food way more than once to know if you like it or not. For example, the first time I ate chèvre I wasn’t sure I liked it; now, I eat it by the spoonful on crackers. So even though I know he doesn’t like chicken breast, I still serve it to him with different seasonings to see if we can find the one he’ll enjoy. The thing that has really forced me to give a variety at every mealtime is our EZPZ Less Mess Happy Mat. It’s divided into three toddler-sized portions, so I’m sure to put something different in each one (plus, it’s almost impossible for your kid to pick it up and throw it because it suctions to the table/high chair- win win!). Doing this also forces me to realize the color palette I’m serving to make sure it’s varied too- all orange, brown, or white don’t often make for a well-balanced, healthy meal. 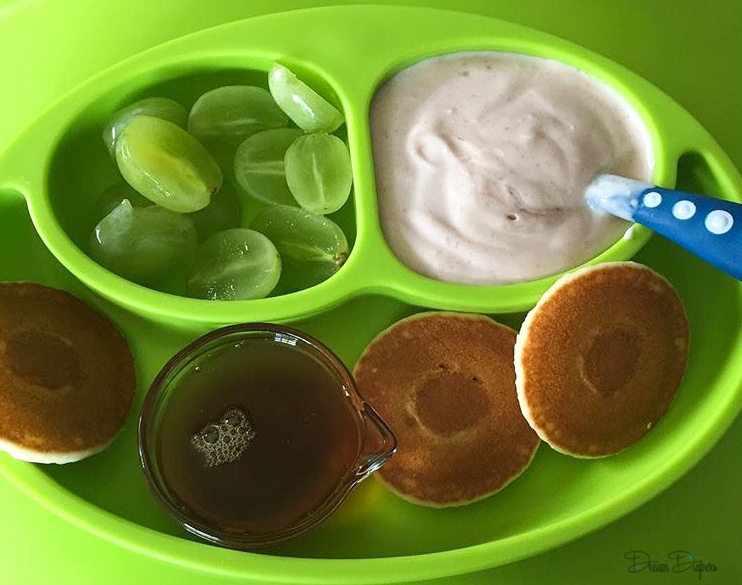 The key is that you want your kid to have a few things they know they will eat on their plate so that no one is left with having eaten nothing and crying at bedtime that they’re hungry. 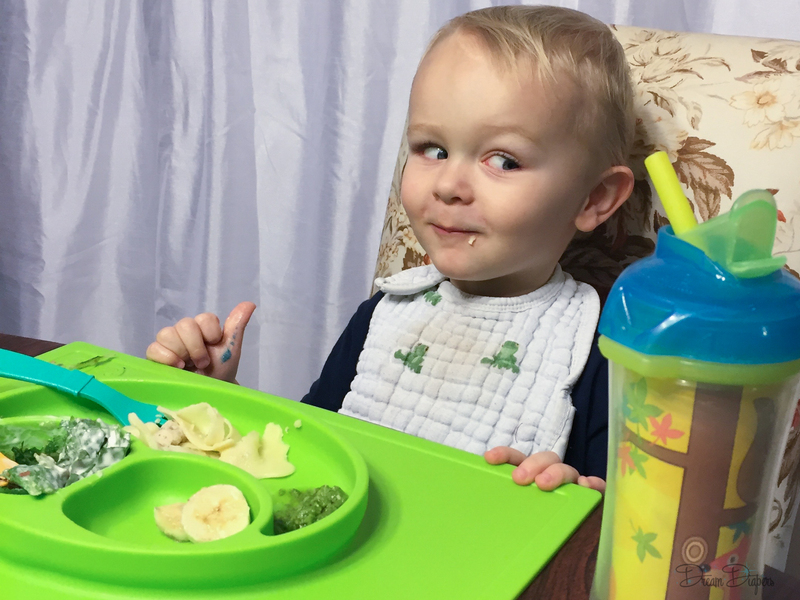 If mealtime at your house is a nightmare for mechanical reasons, be sure to check out the EZPZ silicone place mats (for easy clean up) and try using fun cookie cutters (search “food cutters” on Amazon or the like) for making mealtimes more visually appealing and fun for toddlers- a perfect tool for introducing new foods in a familiar way! Finally, just try to remember that your kid will not starve if he doesn’t get fruit snacks but refuses to eat his lunch. 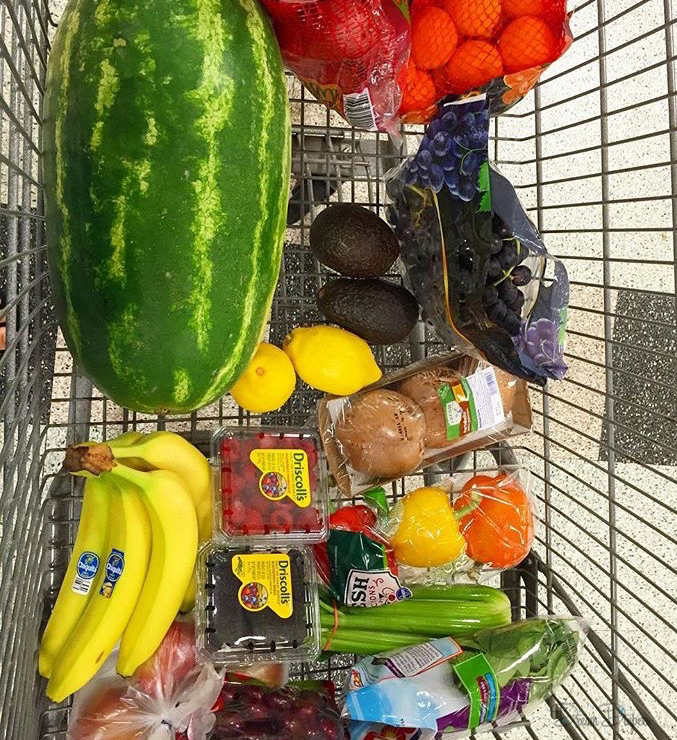 He’ll get hungry, and when he is, he’ll relent to eating healthy foods instead of nothing. All we can do is try to instill in our kids the healthy eating habits most of us we wish we had in ourselves by living by example and being as consistent as possible.